Douglas Everett Sparks and his twin sister, Debbie, were born and raised in the inner city of St. Louis, and later Ferguson, Missouri. They were four years old when their dad was diagnosed with Parkinson’s disease and after being hospitalized for ten years, he died when they were 14. Doug’s mother was a woman of deep faith and took the children to the Baptist church for Sunday School until they were baptized, at age six, in the Roman Catholic Church. Financially, their lives faced many challenges and she worked hard to send them to parochial school. Doug had the chance to be a chorister at the Cathedral from second through eighth grades and this experience drew him closer to God, with an increasing love of music and a sense of call to ordained ministry. Learning the story and witness of St. Vincent de Paul was especially compelling for Doug and he wanted to live his life as a priest in service to the poor. He went to St. Vincent’s College, a preparatory high school, and then entered the Novitiate for the Religious Order founded by St. Vincent de Paul, called the Congregation of the Mission. However, his faith journey took several twists and turns, in and out of the seminary. He was trained as a paramedic and, at one point, even considered pursuing medical school, but the sense of call to ordained ministry continued. Doug graduated from St. Mary’s Seminary College in 1980 and went to Chicago for seminary, where his world view expanded tremendously, including his first experience of the Episcopal Church. It was also the beginning of his desire to work within interfaith and ecumenical communities. Doug was ordained a deacon in April of 1983, served an internship in a congregation in the inner city of St. Louis and was ordained a priest in June 1984. He then served as an associate pastor at St. Vincent de Paul Parish in Cape Girardeau, MO for two years, before becoming part of a ministry team for five parishes in the Four Corners area of Colorado. After much personal reflection and a number of theological reasons, Doug made the decision to move to the Episcopal Church. He and his wife, Dana Wirth Sparks, were married in December 1988 and he completed a year of Anglican Studies at Seabury-Western Theological Seminary. He was received as a priest in 1989. That June he began serving as the Assistant for Youth and Young Adult Ministry at St. Gregory’s Episcopal Church in Deerfield, IL. In May of 1990, Doug was called to serve as the Priest Developer of St. Luke’s Episcopal Church in Whitewater, WI in the Diocese of Milwaukee. He served as Chairperson of the Catechumenal Commission and completed a Doctor of Ministry in Anglican Studies from Seabury-Western in May of 1993. In January of 1995, he began serving as the Rector of St. Matthias Episcopal Church in Waukesha, WI. Given the opportunities for Congregational Development in Waukesha, Doug began a three-year course in Congregational Development at the Seabury Institute in July of 1996 and was awarded a Certificate in Advanced Studies in Congregational Development. In August of 2002, Doug and his family were called to the Anglican Church in Aotearoa, New Zealand and Polynesia to serve as the Dean of the Wellington Cathedral of St. Paul. It was a tremendous opportunity to experience life outside the United States and the Episcopal Church. He learned a great deal about serving in another independent and autonomous Province in the Anglican Communion, especially the distinct differences in polity and governance. In July of 2004, Doug began serving as rector at St. Luke’s Episcopal Church in Rochester, Minnesota. He served as a Deputy to three consecutive General Conventions and served on the Ecumenical and Interreligious Legislative Committee in 2009. Doug was then appointed to serve on the Joint Standing Committee for Program, Budget and Finance for 2012 and 2015. In 2012, he was appointed Treasurer of the Episcopal Church in Minnesota and served until being elected bishop in Northern Indiana. Doug and his wife, Dana, live in South Bend and have three adult children – Christina (writer, artist, musician and overall Renaissance woman), Graham (Political Science graduate, community engager, soccer player and musician) and Gavin (businessman, outdoorsman, soccer player and musician.) Dana was previously a broadcast journalist and currently teleworks for the Mayo Clinic Public Affairs Communications Division. 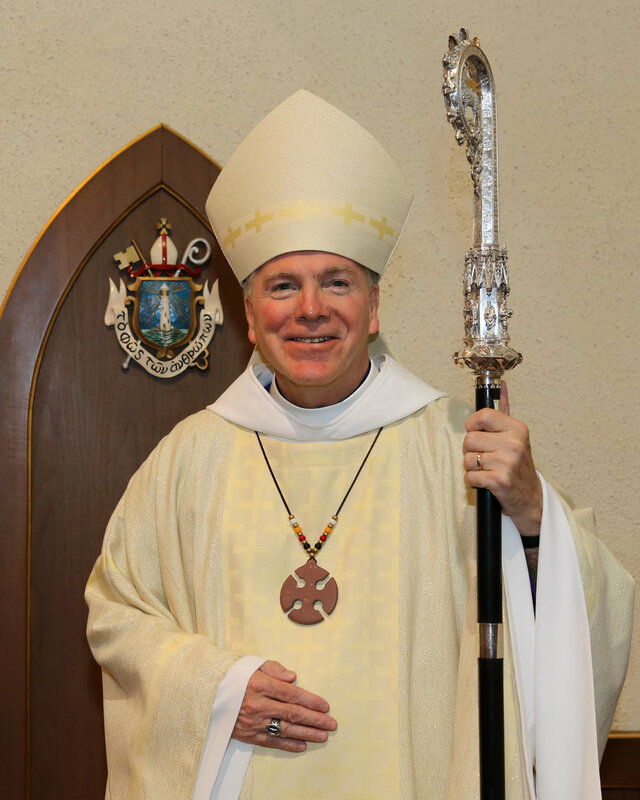 Douglas Sparks was ordained the 8th Bishop of the Diocese of Northern Indiana on June 25, 2016. He is committed to the faith communities in Northern Indiana and the wider church, encouraging and increasing conversations with our neighbors. Personal Ministry Statement – I strive to be a servant, storyteller, presider, preacher, pastor, teacher, singer, risk-taker, and reconciler for the sake of proclaiming Jesus, the Risen Christ and engaging God’s Mission.